President Trump participates in a roundtable on immigration and border security at the U.S. Border Patrol Calexico Station in Calexico, Calif., on April 5. In a Wednesday morning tweet, the president called on Congress to return early from the scheduled two-week April recess to pass a border bill. Administration officials last week told White House reporters that they want Congress to act to change immigration laws affecting how families are held in detention, the processing of unaccompanied minors at the border, and the criteria migrants can use to claim asylum. The collective goal is to discourage more migrants from attempting to cross the border and to make it easier to hold them in detention if they do. Drew Hammill, a spokesman for Speaker Nancy Pelosi, D-Calif., told NPR the White House's ideas are "an anti-immigrant wish list that does nothing to keep our country safer and erodes our values as a nation of immigrants." Last week, the speaker defended congressional action on the border, noting the bipartisan spending deal reached in February and signed by the president included significant border resources, including $1.375 billion in funding to build barriers along the U.S.-Mexico border. "There is money there for increased judges to adjudicate the cases more quickly; there is funding there for humanitarian assistance for the people coming in; there is money for repairs and for physical necessities that may be there; and there is funding to send to countries of the Northern Triangle [Guatemala, Honduras, and El Salvador] to try to alleviate the problem before it reaches our shores," Pelosi told reporters. House Democrats do plan to act on immigration this year, but on a revamped Dream Act to provide legal status and a path to citizenship for up to 3.6 million people who were brought to the U.S. as children and reside in the country illegally or who are in legal limbo through the Obama-era Deferred Action for Childhood Arrivals program that is being challenged in court. For two years, President Trump has offered varying degrees of support for the Dream Act and taken it on and off the table in sporadic negotiations on immigration that have yet to result in any tangible immigration proposal that can pass both chambers of Congress and earn his signature. Senate Majority Leader Mitch McConnell, R-Ky., who is up for reelection in 2020, told reporters last week that he was open to a new round of immigration talks. 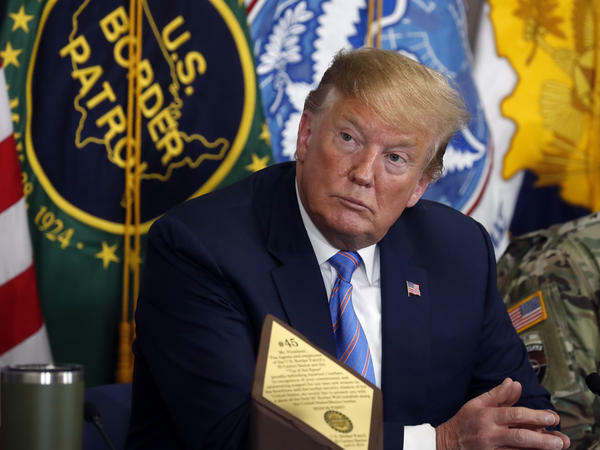 "I think it's way past time, on both sides, that we sit down together and see what we could agree to to improve the situation, not only border security, but also the asylum laws that are very challenging when you are confronted with this onslaught of people," he said. He did not elaborate on what could clear a 60-vote hurdle in the Senate. Efforts to pass comprehensive immigration legislation have failed under the previous two administrations, and it is far less likely to succeed under Trump as the two parties move further apart on the policies needed as the 2020 elections near. The president and his allies have always seen his hard-line stance on immigrants and immigration as a reason for his 2016 victory and a key to bolstering his prospects for reelection. Meanwhile, Democrats see opposition to Trump's immigration policies as a reason for their own successes in the 2018 midterms and believe they can campaign on the issue with minority voters heading into 2020. NPR's Mara Liasson and Kelsey Snell contributed to this report.